New Survey: Middle-Income Americans Concerned About Their Financial Future - Primerica Inc.
Press Release from Primerica Inc.
DULUTH, Ga., March 27, 2019 /PRNewswire/ -- Primerica, Inc. (NYSE: PRI), a leading provider of financial services to middle-income families, today released its 2019 Primerica Financial Security Monitor, which found many Americans remain anxious about their long-term financial security. The survey of 1,000 middle-income Americans with household incomes between $29,000 and $106,000 was completed in February and found that many families are not taking steps toward a secure future. The Monitor provides a detailed snapshot of middle-income Americans financial preparedness, habits, and concerns. Only half of middle-income Americans believe their financial security will improve in the next five years. Just one-in-four Americans feel aware enough to be very comfortable determining how much they need to save for retirement on their own. Half have never met with a financial professional. And the Monitor'sFinancial Security Scorecard– which measures individual financial security preparedness – found that only 31% of Americans earn an A or B for preparedness based on answers to key indicators. "The survey confirmed our experience in the middle market. Most working families don't feel confident enough to take the steps necessary to achieve financial security. As a result, they are not optimistic about their financial futures," said Glenn Williams, Primerica CEO. "Primerica's representatives are focused every day on helping middle-income families across North America. We break down financial concepts into straightforward language and provide a financial roadmap to help families determine the right next steps to a more secure financial future." Costly Financial Mistakes and the Value of Financial Guidance. Nearly two-thirds of respondents (61%) acknowledge making at least one really bad financial mistake, with an average loss of more than $27,000. The Benefit of a Financial Professional to Long-term Preparedness. Having enough savings to cover three months of expenses if the primary breadwinner loses his or her job. Close to half (43%) reported doing two or fewer of these financial fundamentals. But those who have met with a financial professional showed stronger results: 76% of those who have met with a financial professional earned a C or better, compared to just 39% of those who have not. * Percentages rounded to nearest whole number. Biggest Financial Fear is Being Ready for Retirement. The No. 1 fear among middle-income Americans is not saving enough for retirement (43%). When asked why they don't save more, half (50%) say it's because they don't make enough money to save. Many Concerned About Credit Card Debt. High credit card debt is the second-rated concern, with one in three middle-income Americans saying it's their biggest financial concern. More than half do not pay off their credit card balance every month, and one-in-five make just the minimum payment or less. The average credit card debt of all respondents is nearly $3,000. The third biggest concern is paying medical bills (22%), followed by worries about stable income (20%). More to Do to Prepare for Emergencies. Just over one-third are confident they could pay for an emergency expense, and 69% worry about how their families would cope financially if faced with a major medical expense, or if a significant economic recession were to hit (67%). Millennials Not Comfortable 'Going at It Alone' Online. The Monitor survey also examined differences in attitudes and behaviors towards personal finance across generations. Although they are the first generation to grow up as "digital natives," millennials are the most uncomfortable of any age range doing personal financial tasks online. These respondents, between the ages of 18 and 34, are the least likely to be comfortable opening an investment account, buying insurance, completing taxes or tracking their financial progress without working directly with a financial professional. 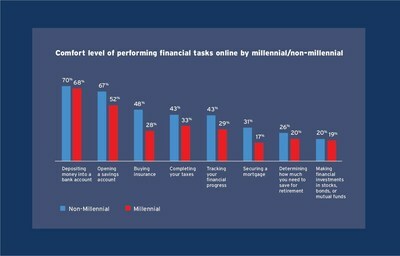 Feeling comfortable completing personal finance tasks online, unassisted, is highest among Gen Xers (the 35-54 age range). "The finding that millennials are not comfortable managing their personal finances electronically is surprising, because we know they are very tech savvy," Williams noted. "The idea of 'going at it alone' with their personal finances can cause a lot of anxiety, and they need in-person support from a financial professional to feel confident about their decisions — especially those who are just starting out." The Monitor survey revealed that while there are some differences regarding overall financial know-how and habits, financial anxiety and uncertainty was prevalent among all groups. "Our Financial Security Monitor confirms that financial security is something that everyone strives for and most people would benefit from the assistance of a financial professional in mapping a course toward that goal," Williams added. "Due to our 40 years of experience helping middle income families prepare for their financial futures, Primerica is uniquely positioned to provide that critical part of the financial equation." This survey was conducted by Quadrant Strategies, an independent research firm, on behalf of Primerica. The nationally-representative online survey polled 1,000 middle-income Americans, including oversamples of African Americans and Hispanic Americans. The poll was completed in February 2019 to better understand their knowledge, attitudes and behaviors related to their personal finances. Respondents were ages 18 and older and had total annual household incomes between $29,000 and $106,000. The margin of error is about 3 percent on the total sample and greater for data specific to subgroups. All data from the survey was weighted to match the U.S. Census on race, gender and age. Primerica, Inc., headquartered in Duluth, GA, provides financial services to middle-income households in North America. Primerica licensed representatives educate their clients about how to better prepare for a more secure financial future by assessing their needs and providing appropriate solutions through term life insurance, mutual funds, annuities and other financial products. Primerica insured approximately 5 million lives and had over 2 million client investment accounts at December 31, 2018. Primerica, through its insurance company subsidiaries, was the #2 issuer of Term Life insurance coverage in North America in 2017.Primerica stock is included in the S&P MidCap 400 and the Russell 2000 stock indices and is traded on The New York Stock Exchange under the symbol "PRI".